Unleash your creativity with the latest matching set of haircutting shears from Washi. Perform precision work while relaxing your hand on this soothing tool. Includes a 5.5-inch cutting shear, blending shear, texture razor and a carrying case. Washi is proud to introduce its latest matching set of haircutting shears. 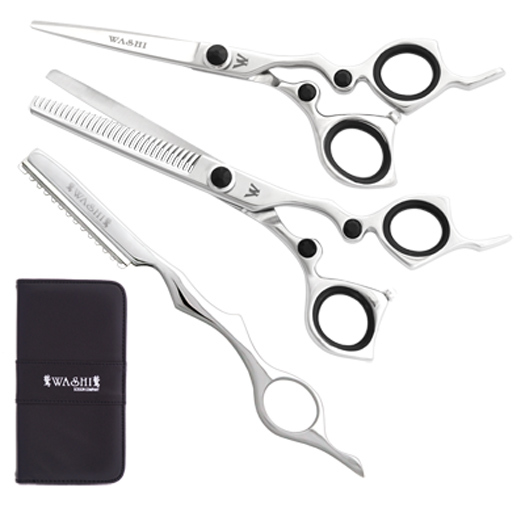 This shear set allows you to unleash your creativity. Made from Japanese 440C Steel for durability and a long lasting edge. Perform precision work while relaxing your hand on this soothing tool. Includes a 5.5-inch cutting shear, blending shear, texture razor and a carrying case.